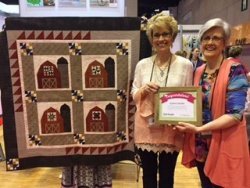 We received the honor of being selected as a featured Top Ten Quilt Store and will be featured in the fall 2017 Quilt Sampler magazine! Woot! Woot! We are humbled and feel it is because of the continued commitment from our customers that we are receiving this recognition. Our original quilt design is shown here. The pattern and kit will be available in September when the magazine comes to our store. We want to thank our very own, Janice Williams, for the superb quilting. In all of the excitement, we almost forgot to post our Women of the Bible block. For your free pattern, CLICK HERE!